Well after having an opportunity to enjoy seeing the Milky Way in the dark skies of Casper, WY, it was time to see just how much of the MW would show up in a camera image in these city light skies. So, since a major portion of the Milky Way is located just to the left of Saturn at this time of year, I aimed the non-tracking DSLR with new 28mm lens at that location and took this 30 second exposure. Well, there are some thin clouds in the sky, but no visible Milky Way, which should have been there just above the palm trees. 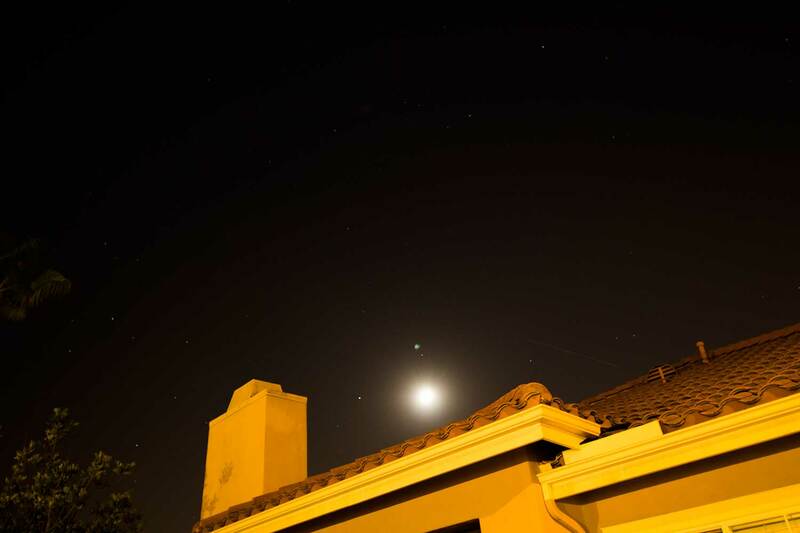 But what is that greenish/blue object just to the left of the overexposed moon? Yep, it sure looks like a comet. But if it is a comet, what comet is it? 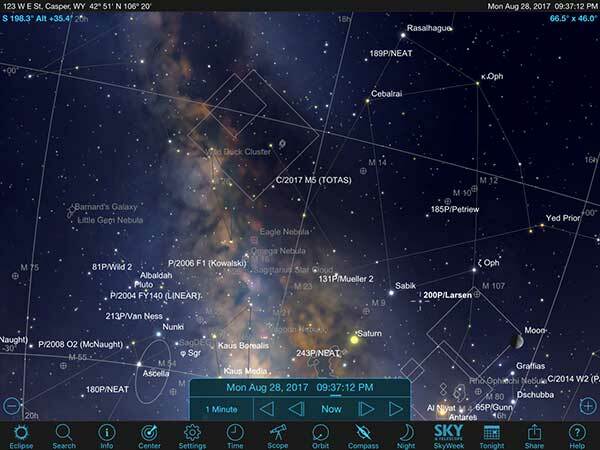 So, let's go to Sky Safari Pro app on the Ipad and check what should be visible with that camera field of view at that time of night. See the screenshot below. You can see the major belt of the Milky Way, just to the left of Saturn and the comet 200P/Larsen, just to the left of the moon. During the eclipse, the moon was our friend, but now it is only used to place the camera in the right position and it is so bright that it exposes everything around it. But the observed comet seems to be 200P/Larsen (magnitude app. 18). After finding this unexpected comet instead of the Milky Way, I elected to go out the next night with a 100mm telephoto lens. This lens should give a larger, approximately 100/28 = 3.5 times, image of the comet. But, since this image was also planned to be on a non-tracking tripod, the field of view rotates 3.5 times faster than previously, so more image distortion and star trails could result if the same 30 second exposure were used. It is a tradeoff, but without a tracking mount, this is sometimes the choice to be made. 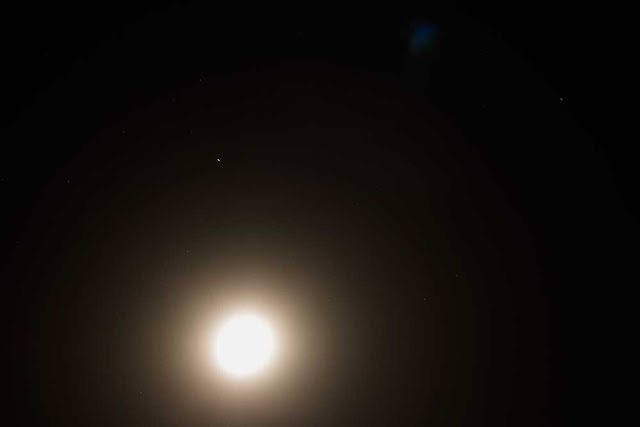 To compensate for Earth rotation, I took this next photo with just a 10 second exposure and the moon just below field of view. Hey, where is the comet? 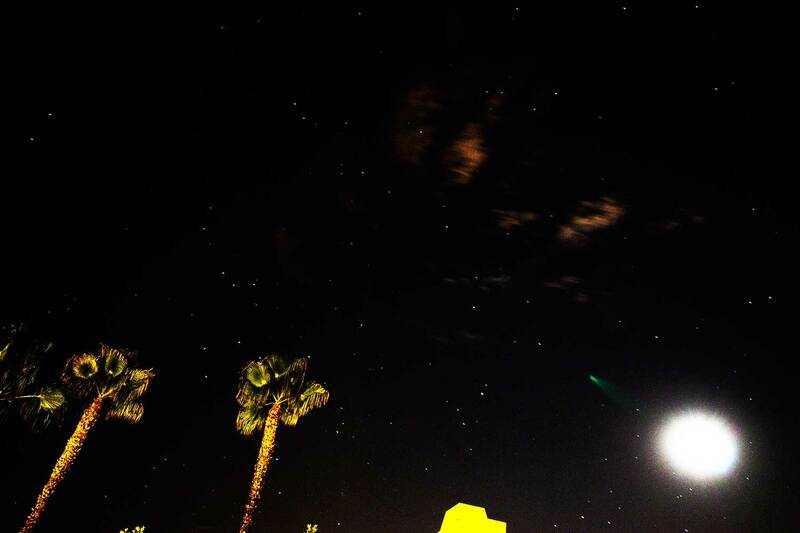 Ok, ok, maybe 10 second exposure is just not long enough for the comet to show up in the glare of the moon. 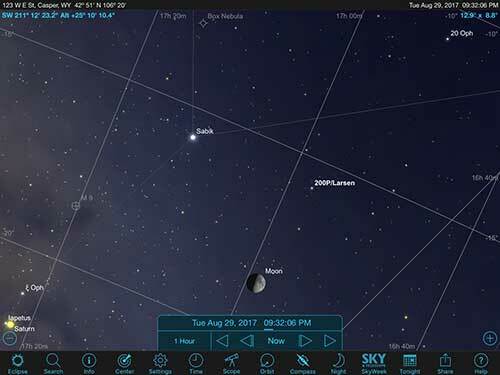 Check out the Sky Safari Pro screenshot showing the location of he comet 200P/Larsen, with field of view adjusted to approximately match the 100mm field of view. Had, I read something wrong and not selected the right time? Nope, all of that checked out, so it must just be the exposure time is just not long enough. To check that out, I switched out the 100mm lens and put the 28mm lens back on to check this out. 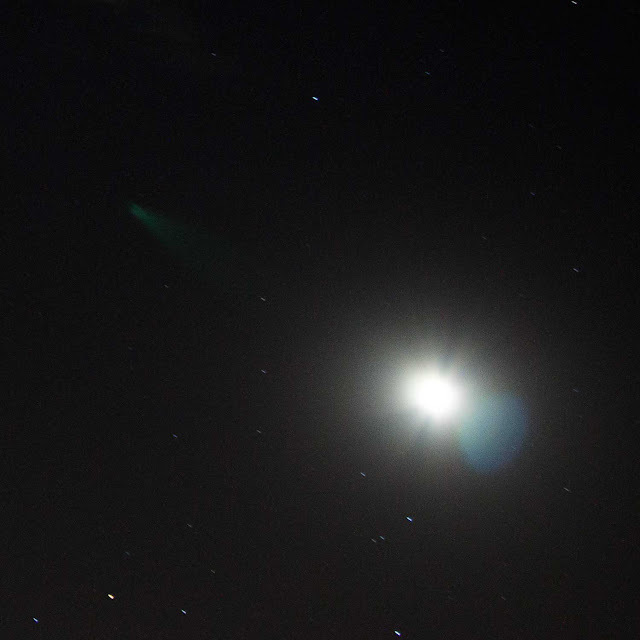 The image below shows the comet just above the moon. Ok, let's go back to use the 100mm lens and consider longer exposures. It turns out that the 100mm lens can be set with aperture 4.5 rather than 5.6. Hey, this could be a big deal. Remember that the image of the comet in a 100mm lens is 3.5 times larger in two-directions, so the area of the image is 3.5 * 3.5 = 12.7 times larger than the same image with a 28mm lens. But the aperture is 3.5 times larger and the amount of light received goes up as the square of the aperture diameter, so the same amount of light per unit area is received for both lens. The problem though is the exposure time for 28mm lens was three times longer (30 vs. 10 seconds) than for the 100mm in order to minimize star trailing. But, 100mm lens can be set f/4.5, which is a wider aperture and will capture more light. 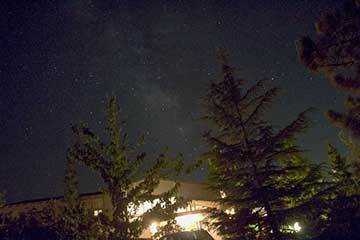 The photo below was taken with 10 second exposure and aperture set to f/4.5. Ok, so a blue blob of the comet now shows up but there is not any of the increased detail that I hoped would be there. It seems more exposure time is going to be needed and that will call for a tracking mount. Maybe next time. 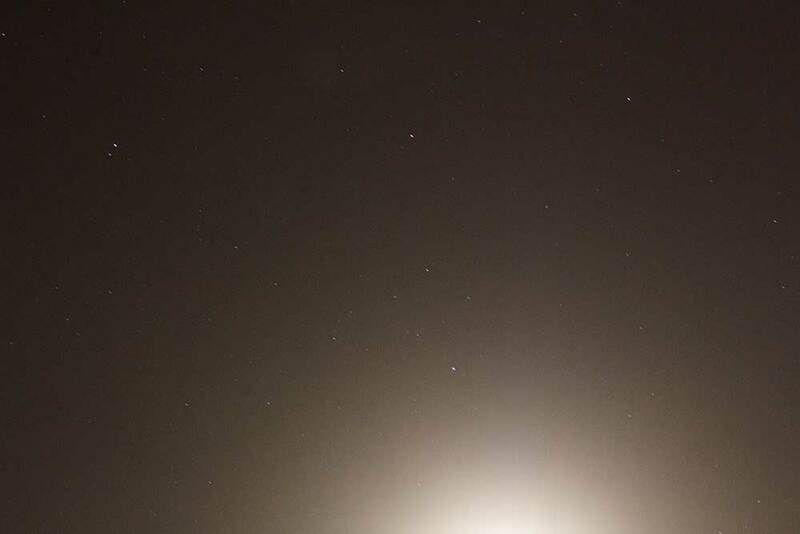 Anyway, we can expand the first image with the 28mm lens and get a little bigger view of the comet. See below. You can see some star trailing. Even with the 28mm lens the stars show up as oblong objects, but 30 seconds or more is required to capture the comet. There also appears be some ghost imaging of the moon due to camera internal reflections. The lesson learned is that just because you can't find the Milky Way, don't despair, you might just find a comet.